Finding apps isn’t difficult. Finding education apps is only a bit more challenging. Finding free education apps is also possible. Finding free education apps worth downloading is a different story entirely. At your fingertips on your Android device, you can browse nearly all the information compiled since the dawn of civilization with a quick search on Google. And that’s just the beginning… You also use your handy Android device to take full University courses, listen to audiobooks or podcasts, learn a new language, and become a better self-directed learner and much more. 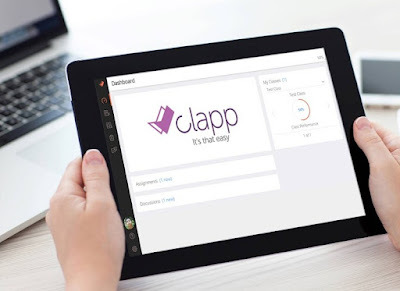 The following is our one of our favorite apps for learning, called Clapp. It is an online virtual classroom, designed for both teachers and students. Created to enhance your learning or teaching experience, this productivity app can improve communication with teachers, improve collaboration with peers, strengthen knowledge with self-made videos, seamlessly incorporate material and content from the vast Internet, improve productivity with virtual classrooms tools, etc. Let’s see what it has to offer. Clapp is one of the greatest whiteboards and interactive tools we’ve ever encountered. Why? Because it offers an incredible amount of flexibility which can enhance both teaching and learning processes! It is a cloud based educational app full of useful features, such as: record audio and video to create lessons, use teaching diagrams, pictures, shapes and fonts, save drafts, manage classes with assignments, announcements, discussions and grades, control who can see what and for how long, share your work wherever you want, work together in study groups, and so much more. It is time to connect the dots in your education, so download this user friendly and beautifully designed app for your Android tablet and don’t forget to check out its premium features too!